Each payment method has pros and cons. When it comes down to it, it all depends on personal preference. Smart Touch Energy only accepts online payments. Because of its high convenience and high security, we think online is the best way to go when thinking about how to pay for heating oil. Nevertheless, we are going to explore different payment options and let you decide which works best for you. Heating fuel is a necessity to many, so above all else, you need a method that makes delivery fast, easy and within your budget. What is COD (cash on delivery)? COD means you pay for your heating oil when it's delivered. In other words, you do not have to pay anything until your oil reaches your doorstep. COD is a popular payment method for some, because consumers prefer to build trust with businesses before making any payments. By seeing their products before finalizing their purchase, they know they are not getting scammed. Some people prefer COD because they do not feel comfortable making payments online, or because they do not have a credit or debit card. If you like to make most purchases with cash, COD may be the best option for you. You may also choose this payment method to postpone payment until you know your product has arrived in satisfactory condition. If a product, like heating oil, arrives and isn't in the condition you ordered, you may refuse to purchase the oil at the time of delivery. Likewise, if you no longer have the funds to pay for the oil, you may refuse to finalize a purchase. However, depending on the product or the company, you may be expected to pay a delivery fee or return fee, even if you do not accept the product. Many people would rather not deal with COD, especially considering most do not carry cash on them or want to spend the time to write a check or buy a money order. COD can be far more time-consuming and inconvenient than other payment methods. According to a 2016 Gallup poll, only 24 percent of Americans make all or most of their purchases with cash. Why spend the day waiting around for a delivery when you can take care of everything online? When it comes to COD, it seems the cons outweigh the pros for most customers. Prepay means you pay for a good or service in advance. Although prepayment may seem like a convenient option, it may not be the smartest way to go. 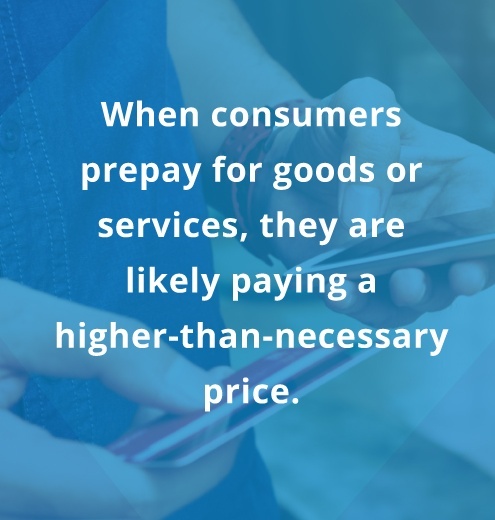 When consumers prepay for goods or services, they are likely paying a higher-than-necessary price. Think about it — how do you know how much of a product you will use in advance? It's hard to predict future consumption, while it's easy to make an error in prediction. Future consumption needs are especially a concern with heating, as you never know how cold it will get outside, and oil market prices are always fluctuating. Although you can estimate heating prices from past consumption, the risk of paying for more than what you'll use is high when you prepay. This idea applies to any good or service. Prepay is probably not the best payment method for anything. However, despite the downsides, every method has its pros. Due to the nature of changing oil prices, you probably want more freedom to purchase oil when prices are low and not be stuck paying a set price upfront for something you may not even use. Online payment is an ideal payment method for many reasons. First, it's convenient, fast and puts you in control. Plus, credit cards have excellent fraud protection programs. If you suspect something fishy is going on, all you need to do is check your credit card account activity and make a simple phone call. With an online payment method, you don't have to scramble for cash, purchase a money order or write and mail a check. If you are concerned about sharing credit card or bank information online, consider this — when you mail a check or money order, you are sending a physical piece of paper through the postal service. Anyone could get their hands on your information from the mailbox to the destination. There is always the risk of physical mail getting lost as well. However, when you pay online, your information goes through a highly secure system that tracks and records all the details of the transaction. Even using a credit card in a store is riskier than paying online. There have been many instances of credit card fraud occurring at in-store terminals. The point is, whether you make payments online, mail checks or pay at a register, there is always the threat of fraud. However, making an online payment is far more secure than you may expect, and is the preferred method for many because it is incredibly convenient. Another major bonus of an online payment option? It's much faster than other payment methods, meaning you can often wait until the last minute and still make your payment on time and avoid late fees. Online payment takes only a few moments out of the day. If you opt to save your login information on the website, it can be even quicker. With online payments, you'll save costs on stamps, envelopes, driving to a post office and more. Plus, no more standing in line to buy stamps or envelopes. Time is just as valuable as money, and online payment options save you precious time. Lastly, you'll always have a record of your transactions when you pay online, which can help you monitor your spending and plan budgeting in the future. Plus, you can easily keep track of all payments and view your online payment history. No need for stockpiling receipts and file folders. If you are still concerned about the security of making online payments, there are steps you can take to make sure your payment information is secure, including the following. Use a credit card instead of a debit card: Credit cards have better protection against fraud. If someone steals your debit card information, it could be days before you find out, and they can get control of your bank account funds in the meantime. Do not make purchases on public computers: If you use a computer in your local library, for example, do not buy anything there. Your login information might get saved on the computer. Make purchases only on personal computers and devices. Update anti-virus software: Always make sure your computer has the protection it needs with regular maintenance and updates. Many types of software install updates automatically. Use a strong password: Strive to create passwords that aren't easy to guess. Make unique passwords for each site that use a combination of numbers, letters and symbols. Don't use your name. Check the address bar: Make sure there is a padlock symbol in the address bar, as well as a web address that starts with https://. The "s" stands for "secure." Although you need to be smart about online purchases, just as you would take caution with any purchase you'd make, it is not something to fear. Online payment is becoming the norm, as people are paying everything from rent to loans online. In fact, according to a 2017 survey by ACI Worldwide, customers pay approximately 56 percent of all bills online. The survey also found bills paid by check declined by 20 percent between 2010 and 2016. 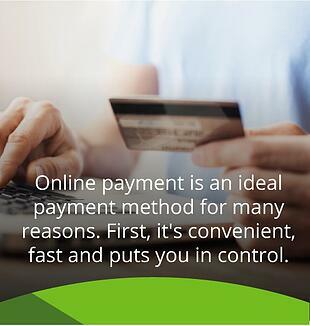 Keep in mind the many pros when deciding if online payment is right for you. Although the pros outweigh the cons, there are still a few things to consider when deciding if online payment is right for you. It may take a few days to process in your bank account. If your funds are running low and you don't have enough to cover an online payment, you need to consider that and allow time for processing after adding more funds. You will not always want to wait until the last minute to avoid late fees. You need to be aware of typos and make sure you are placing the decimal in the right place. For example, $20.57 can easily become $205.70 if you don't pay attention. You must pay on time and keep track of payments and payment schedules. Because online payment is so easy and quick, it may also be easier to forget about. Finally, another plus for paying online for heating oil is you can pay when prices reach a low point. Unlike with prepay, you know you are getting the best available deal when you choose when to pay and what you are paying for. Autopay is similar to prepay, except it occurs at a preset time. It's a convenient option because you never have to schedule or make time for payments. With autopay, you can live your life without ever thinking about your bills. However, this can also be problematic. Even though autopay gives you one less thing to worry about each month, you still need to monitor your bank account or credit card activity. You don't want to risk an account overdraft. If you've ever experienced an overdraft, you probably know fees can build up fast. Autopay may be a convenient choice if you always have enough money in your account to cover monthly bills — even if your bill amounts vary each month — and if you pay attention to account activity. If you tend to run low on funds at the end of the month, or if you easily lose track of payments, you might want to choose a different payment option like online pay, which makes you more in control and more aware of account activity. Even with auto payments, always periodically check your account information to make sure everything looks correct. Otherwise, you may wind up in far more debt than you realized or a victim of fraud. If you're struggling to stay on top of winter heating bills, you'll probably need to sign up for a payment plan. A payment plan can be a helpful option if you'd rather spread costs out over the year, rather than pay larger amounts throughout the winter. Heating can get pricey in the winter, and costs fluctuate. A lot of factors affect the price of oil, so it's hard to predict how much money you'll need to save for your winter bills. A payment plan helps alleviate some of the financial stress of winter heating bills because it allows you to spread out equal payments throughout the year. For example, say your heating bill is usually $400 a month in the winter. On a payment plan, you might only pay $120 a month. However, once summer rolls around, instead of paying $50 a month like you normally would for your utility bill, you would continue to pay $120. What's the issue with this option? The problem with a payment plan when it comes to heating fuel is that you'll lock in an oil price at the start of the plan. This may work out in your favor if you lock in when prices are low, but you could lose money if prices go down and you're stuck paying payment plan prices. With heating oil payment plans, you may find yourself wondering if you are being charged fairly in the long run. However, depending on your financial situation, you may not have any other choice but to sign a payment plan contract. If so, a payment plan is a solid option to have. Although you probably don't want to think about heating oil over the summer, that might be the best time to find your oil source for the winter, as prices could be lower during the summer. Remember, no matter what your budget is, it is not always worth going to the least expensive oil service. In the dead of winter, it's most important your heating oil supplier is always available and provides dependable customer service, as well as emergency heating service. Smart Touch Energy offers fast and easy online payment, making payment for heating oil simple and convenient. Instead of dealing with tedious paperwork or time-consuming snail mail, you control your payments and schedule delivery from the comfort of your home or smartphone. There's no need to waste time waiting around for delivery. Enter your ZIP code on our site. View local prices and availability. Expect your delivery within three days from a trusted local dealer. Our service is fast, secure, convenient and can save you lots of money with our everyday low prices. You'll always know what you're paying for before you order. Use the Link below to check live pricing in your area now! For maximum efficiency, we also offer automatic delivery service, which means you don't even have to be home when we make your delivery. Your world does not have to revolve around heating, but you can enjoy a warm, comfortable home all winter long. Still not sure if online payment is right for you? If you have more questions about the best way to pay for heating oil, we are here to help. Smart Touch Energy puts customer satisfaction first, and we want to help you make informed decisions. We know what it takes to keep our customers warm for the best prices around. For more information, check out our FAQ page or contact our helpful Smart Touch support team today. Ready to get started with our great heating service now? Check our oil prices and place your order today!